The Pleiades represents the key to physical protocreaton; it represents the galactic beginning of the physical Adamic household. How does this confirm what the ancients knew about the Pleiades? Many legends of cultural anthropology around the world are concerned with the Pleiades. The Pleiades, in Greek mythology, are the seven daughters of Atlas and Pleione (named Alcyone, Merope, Electra, Celaeno, Taygeta, Maia, and Asterope). Atlas and Pleione are the neighboring stars, and many Greek temples were oriented to the rising and setting of the Pleiades. The Greeks also referred to the word “Peleiades”(spelled with an extra “e”) as the “Doves.” The earliest recorded reference to the Pleiades, however, may be in Chinese astronomical literature dating from 2357 BCE. For agricultural tribes in the northern hemisphere, the course of the Pleiades indicated the beginning and ending of the growing seasons. Probably most famous legend of the Pleiades in native American lore is the story behind Devil’s Tower, Wyoming, a volcanic rock which the local Kiowa Indians call Mateo Tepe. They tell us that once seven maidens camped near the river in a region known to have many bears. One of the bears began to chase the maidens, who knelt to pray for help, calling upon the gods. The ground was raised into the sky. The bear tried to follow in vain and clawed the side of the rock, the marks of which are seen on the Tower. To protect the maidens, the Great Spirit allowed them to remain in the sky as the seven sisters, the Pleiades. To the Japanese, the Pleiades constellation is called Subaru and in Sanskrit it is Krittikas. To some of the aboriginal people of Australia, it is Makara and was recognized to be connected to the Orion constellation. For the Aztec it was called Tianquiztli, which means the “gathering place,” and was considered an important sign of the continuation of life: on midnight every 52 years it appeared directly overhead and assured the ancient Americans that the world would not come to an end. The Aztecs perform a special religious ceremony called the Dance of the New Fire (or Ceremony of the New Fire) once every 52 years to ensure the movement of the cosmos and the rebirth of the sun. This 52 year time period also corresponds to the 260-day religious calendar (Tonalpohualli in Aztec, or Tolkin in Mayan) when it interlocks with the 365-day civil calendar (Xiupohualli in Aztec or Haab in Mayan). Every 52 Haab solar years (73 Tolkin years) these calendars coincide. This was sometimes called by the Aztecs the Calendar Round. The 52 year cycle was said to begin when the Pleiades crossed the fifth cardinal point or the zenith of heaven at midnight. Sometimes not only is the Pleiades in its zenith over Mesoamerica, but this alignment also comes into a full conjunction with the sun (as we will see again in the 21st Century). In addition, two 52 year cycles (104 years) coordinate with a further alignment with Venus (symbolic of the female creative form on a local scale). The Pyramid of the Sun outside Mexico City at Teotihuacan is said to be aligned with the Pleiades, for its west face and many of the surrounding streets were aligned directly with the setting point of the Pleiades on midnight of the night when it is at its highest point. The Pleiades was clearly revered also by the Mayans, who in the area of Chichen Itza knew that the Sun casts a snake-like shadow on the side of the north stairway of the Kukulcan pyramid during the spring equinox. Some scholars have calculated that about 60 days after this shadow’s appearance, when the sun reaches its zenith over the Pyramid at mid-day (May 20 – May 23), there is another direct alignment with the Pleiades. This Pleiades-sun alignment may have a direct connection with Quetzalcoatl, the feathered serpent that came to bring a greater wisdom to the planet. Astronomers tell us that we are in the middle of an interlocking wheel-within-a-wheel within a cosmic time machine that the Mayans and also Egyptians understood, and just as we go around in relationship to our immediate solar paradigm, our entire galactic system currently is moving around in relationship to the larger configuration of the Pleiades, now known to astronomers as Messier 45 (M45). This larger wheel is known as the Precession of the Equinoxes, the period of time that it takes the Earth to pass through one complete cycle of the constellations of the zodiac. It is the earth’s wobble or spinning axis (at an angle) that makes the zodiac appear to move “backwards” one sign about every 2200 years, or about one degree every 72 years. This averages to 12 signs in 26,000 years. The Pleiades occupies a key role in both the Northern and Southern Hemispheres during the Equinoxes and Solstices which are established by this Precession. In the Northern Hemisphere, at the Spring Equinox, the Pleiades rises during the day, and can be seen only briefly at night. Each day the sun gets a little closer in alignment to the Pleiades so that during the Summer Solstice, the Pleiades rises just before the light of dawn. The first visible rising of the Pleiades before the sun is called the helical rise of the Pleiades. During the Fall Equinox, the Pleiades rises at midnight. At the Winter Solstice the Pleiades is visible in the east just after dark. This is because every day it rises some four minutes earlier in the celestial sphere. The Maori of New Zealand utilized the helical rise of the Pleiades, called by them the Matariki, as the beginning of their New Year (June). They also interpreted the Matariki as the mother with six daughters (while others recognized Puanga or Rigel, Orion as the sign of the New Year). Thus, it is in the revisiting of the thousands of ancient sign posts, megalithic centers, and texts of the greatest importance that have been preserved throughout thousands of years of tradition in every part of the world — that we see a profound relationship between the stories of the Pleiades and the origin of humankind. Why were the ancients so impressed with the Pleiades? Key 106 tells us also that The Pleiades is “the cradle and the throne of our consciousness” emphasizing that the program of Adamic life was created in connection with this region of space. And that it is this region of space that will also signal the return of higher intelligence. The Key uses the word ‘throne’ (small “t”) because it represents that place where the higher Hierarchies come together to balance lower creation. There are, in fact, many throne regions, many logos realms of power, working for our spiritual preparation. 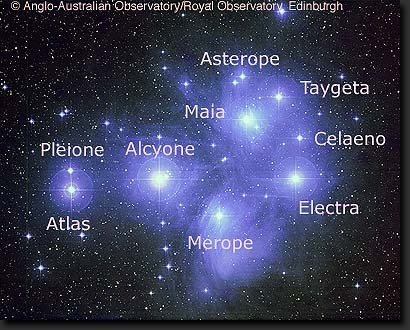 The Pleiades, thus, is a throne center just as Orion is a gateway center. The Pleiades is, thus, a marker for the events of heavenly-earth contact and angelic-human overlap, of meetings recorded by the different cultures of the world with almost uncanny accuracy. Even more imporant is the dawning realization of the immense age and historical plausibility of those legends of the Pleiades found throughout the world which all point to a greater protection and ultimate transformation of creation that will allow us to go back into the higher heavens, being elevated, reprogrammed and resurrected into the heavens of the Most High God.